91% positive reviews for eZee Sales & Support team in a survey. Welcome to eZee Insider, keeping you up to date with what’s happening in eZee. In this edition, eZee Technosys join hands with Websurf Communication & Entertainment, eZee launches new User Interface for eZee Reservation, Check what performance survey says about our Sales and Support team and much more. eZee Technosys signs channel partnership with Websurf Communication & Entertainment, a Namibia based IT solutions company. As a result of the new association, Websurf Communication will now be marketing eZee products in the country of Namibia. After years of experience offering IT consulting services, Websurf Communication & Entertainment is now one of the highly regarded service providers in the country. Along with their existing services, they will now also be offering eZee BurrP! Restaurant Point of Sale as one of their exclusive solutions. This new venture will further strengthen eZee’s presence in the country which have been experiencing boost in tourism in last couple of years. eZee will work closely with the team of Websurf Communication by offering product knowledge and training. eZee looks forward to working closely with Websurf Communication for the foreseeable future. The year 2015 is already shaping up to be an exciting year for eZee Technosys. At the onset of the new year we are proud to announce the launch another brand new User Interface (UI) for eZee Reservation, eZee’s Online Booking Engine. The consumer behavior is constantly changing with time and technological advancement. Keeping up with the latest marketing trends and innovating according to the changing requirements has been the hallmark of eZee since inception. Over the years we have bought innovative features to our clients offering superior user experience and new tools. We understand that no one hotel is the same in terms of operational style, clientele, services, packages, etc. Each hotel offers something different and have specific needs and requirements and for that, one booking engine isn’t sufficient. From small hostels to mid/large hotels, luxury hotels/villas to five star, business hotels to small chains, our diverse clientele offers us a unique perspective in terms of understanding the ever changing nature of online hotel bookings. We have constantly updated and upgraded our booking engine to meet the changing requirements and making eZee Reservation today the only booking engine that offers 5 different User Interfaces (UI) to choose from. We believe that the new UI is even more action driven, providing a clear cut perspective giving users a superior experience and easy navigation allowing hotels to maximize their commission free bookings from their own website. 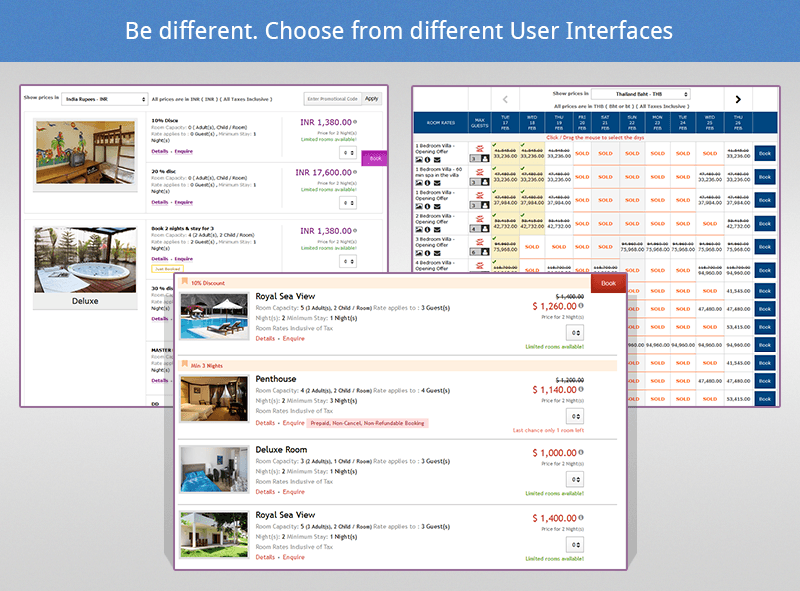 The booking engine becomes even more profitable for the hoteliers with seamless integration with TripConnect, Payment Gateways, Facebook, third-party Travel Websites (OTA) and GDS channels and other PMS. We have developed eZee Reservation with the modern traveler and technology in mind, all the interfaces are responsive and support mobile phones, tablets and traditional desktops. Regardless of the device it is accessed from, eZee Reservation offers uniform superior experience across the board. 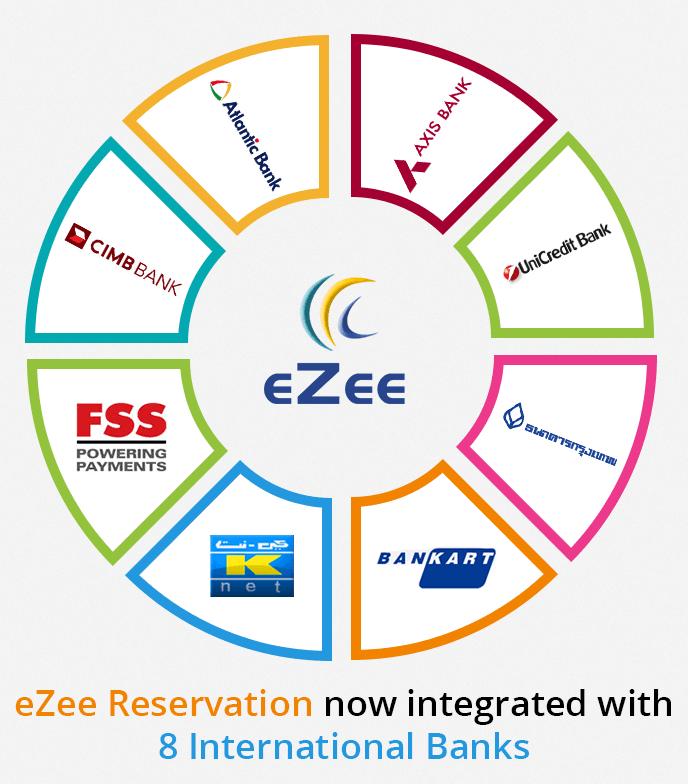 eZee is privileged to announce that eZee Reservation completes integration with eight international banks. eZee Reservation, eZee’s online booking engine through which guest can directly book from a hotel’s website. Hoteliers can link their bank merchant accounts with the booking engine and get faster payments directly from the guests for all the direct bookings. The development will eliminate all the third party services and thus hoteliers will be able to offer their guest, a powerful and secure payment gateway for online payments. This will facilitate real time payments directly into hotel's bank account and allow guests a fast and secure booking experience. In addition the payment gateway also blends seamlessly with eZee Reservation on all the platforms that are desktop, mobile phones and tablets. It is also compatible with Mobile Applications on all the operating systems be it iOS, Android or Windows. With a dynamic booking engine and a secure net banking solution hotels can take their online presence to the next level. The success of any organization depends on the employees of the company and the quality of work they bring to the organization. One of the most pro active and important department is eZee’s Sales and Support team. We have always worked hard towards creating a team who are not only proficient at what they do but provide superior customer service. While organizations traditionally focus on providing assistance when things go wrong, we have worked towards building a team which have adapted with changing needs and requirements of our clients. In our recent effort to further improve our services in Sales and Support, we decided to ask our clients directly to get a clear picture. We conducted a survey with our existing clients who are in communication with various teams members for the month of January, 2015. The response that we received was outstanding, according to the survey, 300 clients provided us their feedback of their experience. In which, 91% were overwhelmingly positive with rest being neutral or negative. On an average the team received 4.5 out of 5 rating for overall customer service, 4.8 for knowledge and understanding and 4.3 for problem solving efficiency. We went through each feedback thoroughly helping us to prioritize issues, client grievances, suggestions and carefully assess over the performance. Furthermore, time was spent discussing way to further improve our services. We will be conducing similar surveys in near future and expect our clients to provide their honest valuable feedback. Our ultimate goal is to keep improving our customer service and make our 24x7 Support one of the best in the industry.